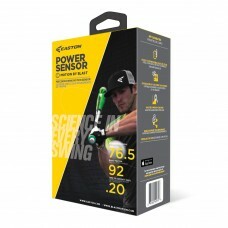 EASTON’S® new POWER SENSOR™ utilizes revolutionary technology to analyze a swing, enabling players to learn how to hit with more power. The precision motion swing sensor sends information wirelessly to Apple mobile devices, and the corresponding free app tracks progress, incorporates video analysis, and allows data to be shared with friends and coaches on social media. The EASTON® POWER SENSOR™ is part of the HIT LAB™ COLLECTION, a full line of training aids to help you make practice more powerful.